Reel Talk Online: First Look: "Alice in Wonderland"
First Look: "Alice in Wonderland"
After purposely missing Johnny Depp in all the wacky Pirates of the Caribbean movies, I am glad to see that his latest project Alice in Wonderland, based on the popular children's book, is something I can get excited about. The role of the mad hatter in this classic tale, which has a new gothic edge brought to us by the visionary director Tim Burton, could not be any more perfect for Depp. Check out a newly released clip below. 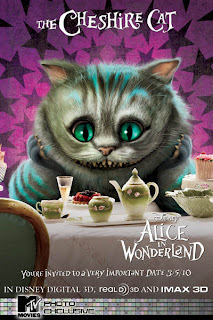 Alice in Wonderland, which also stars Anne Hathaway and Helena Bonham Carter, hits theaters March 5, 2010. Can't wait.